Ok, this may be the episode where you guys finally say, “The hell with you! You have too much time on your hands!” Let me assure you, there are less fiddly ways to accomplish this dish, but I took the tedious and pretty route this time. 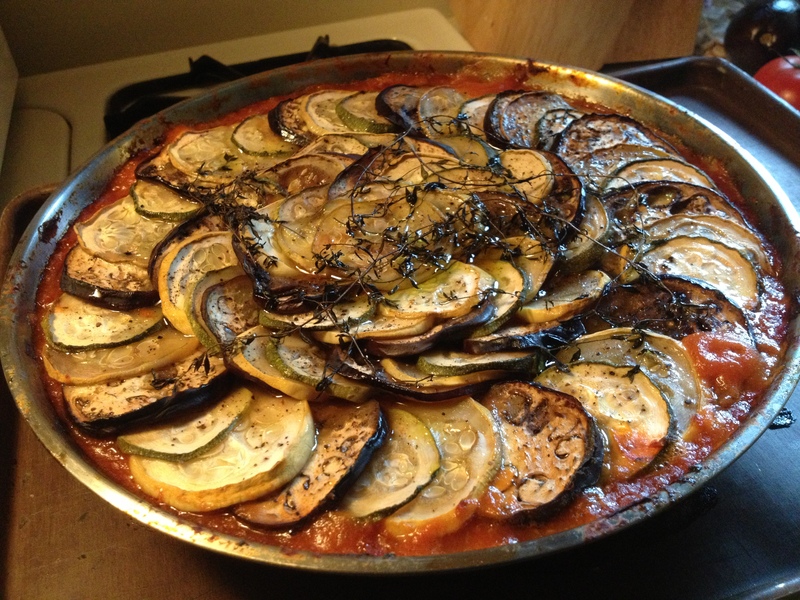 You remember that Pixar film Ratatouille? That simple vegetable dish that warmed the food critic’s heart with memories of his childhood? (If you haven’t seen it, you really should. It’s a sweet movie.) This is that! Since we’re in summertime, this is the perfect use of a lot of beautiful available produce. In a large skillet, heat a drizzle of olive oil and add your carrots, onions, and celery on medium heat (You remember our mirepoix, right?). 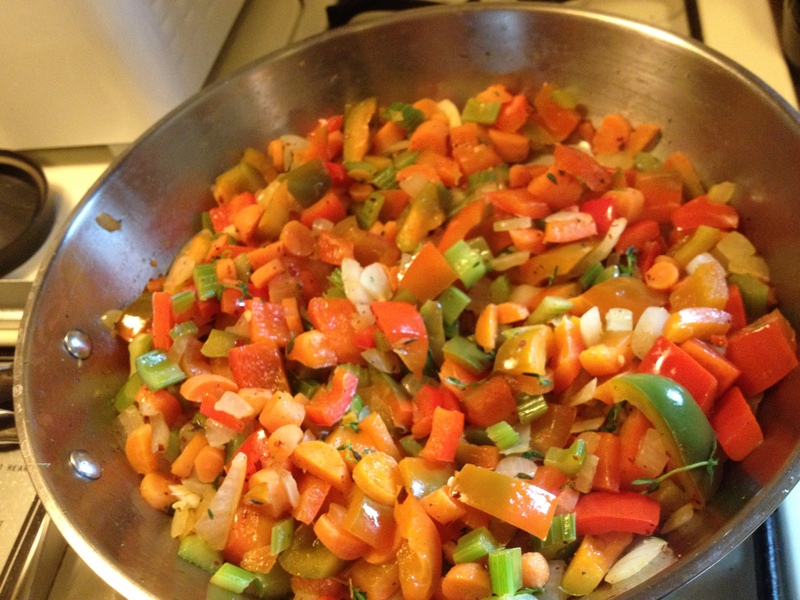 Add the bell pepper, garlic, crushed red pepper, thyme and salt and pepper as the veggies soften. 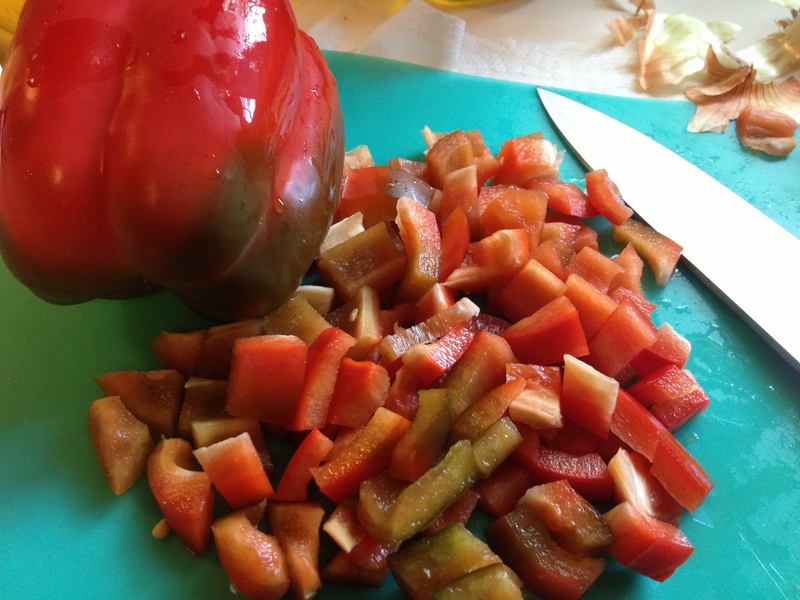 Once all veggies are softened, add the crushed tomatoes. And, as always, please be mindful of your ingredient labels. Keep it simple! Just tomatoes. Maybe salt. Simmer while you prepare the topping veggies. Salt and pepper to taste. The herbs in this sauce are really flexible. If you have herbs de Provence around, GREAT! If you have fresh basil from the garden? Hit it! Customize the flavors to your own mood and preference. Once all the flavors you want are in your sauce, carefully blend it, either in a stand blender or carefully in the pan with a stick blender. Layer smoothly in the bottom of your casserole or oven-safe pan. 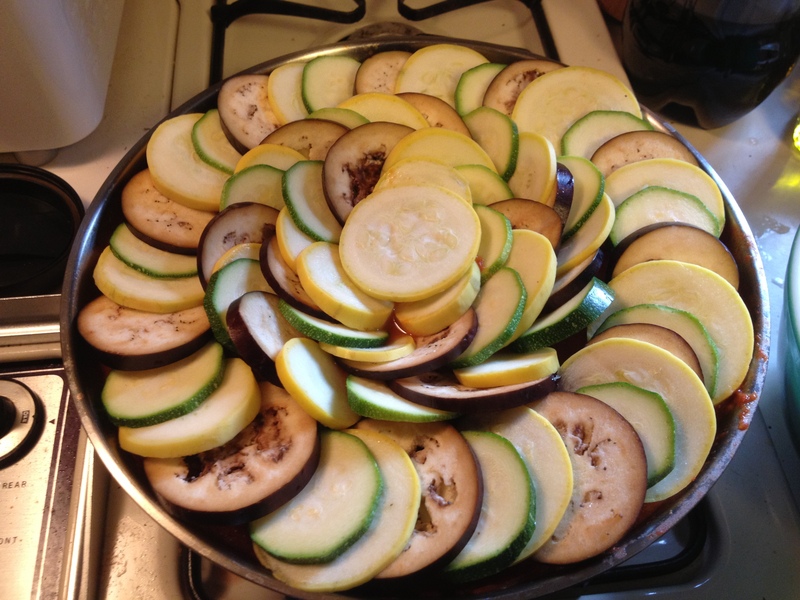 Then you’re going to painstakingly start arranging your painstakingly thinly sliced veggies around your casserole or oven-safe skillet in a pretty pattern. 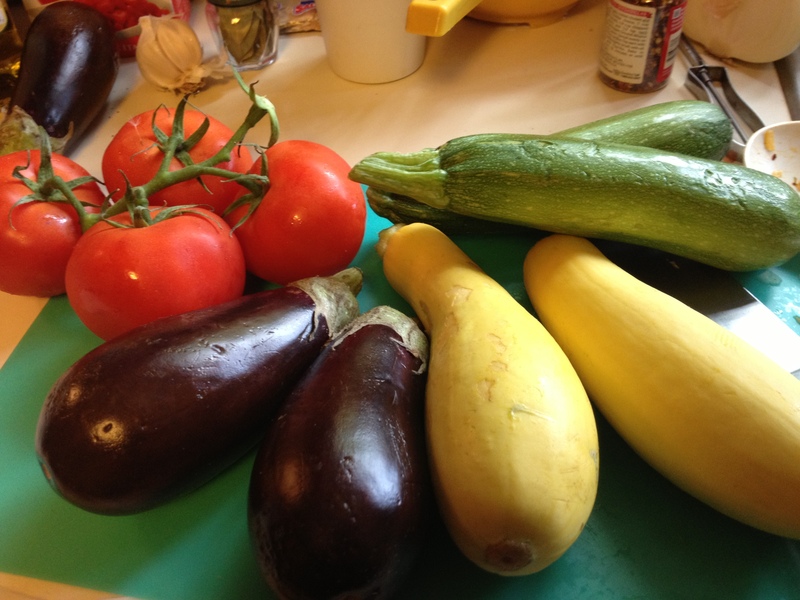 Note: In the photos, I do not have tomatoes in the top layer, because I was a jerk and my tomatoes were just too big to layer with my zucchini and eggplant. Don’t be a jerk like me. Now, why did I say not to use cast iron? Cast iron is more susceptible to acid than other non-reactive cookware. Hence, a tomato sauce can really do a number on your beloved cast iron. And in a slow-cooking preparation like this, there’s even more chance of doing it harm. When your veggies are all layered, salt and pepper liberally, top with whole sprigs of thyme, and drizzle with olive oil. Cover securely with foil and pop in your 280F oven for 3 hours. I placed mine on top of a baking sheet in case of spills. So… it’s not hard. The ingredients are simple, fresh, and healthy. It’s safe for vegans and paleos alike. It just takes some time. Pro tip: You could totally just chunk all the veggies into the tomato sauce and do all the rest the same and it would be fine. If you aren’t worried about pretty, then go for it!